Today I’m excited to introduce a new tool I’ve been playing with over the past few weeks: the Cricut Maker. A few months ago, the folks at Cricut asked if they could send a Cricut Maker and starter kit to me in exchange for an honest review. I hesitated at first, since do I really need another cutting machine? But once I began reading up on the Cricut Maker and all of its digital cutting capabilities, including cutting any of your own designs and ability to cut literally hundreds of materials, I decided to say yes. I’m glad I did since this machine can do anything! This post is a sponsored conversation written by me on behalf of Cricut. All opinions are my own and I only share products that I think are awesome. Note that there are no affiliate links included since I live in Maine where affiliate programs aren’t permitted, but I have linked to referenced products for your ease. Business aside, shall we get on with the fun? Let’s! I’ve played with die cutting machines before, so the concept of a machine to help with the cutting step of quilting is not new to me. Some pros to cutting machines are that they cut perfectly accurately since human error is removed, they are safe since the blade is in the machine and not your hand, and they are versatile. The Cricut Maker is all of these things, but takes versatility to the next level since you can cut all of your own patterns and designs in Cricut Design Space. I set aside a day where I would have a window of a few hours without any of the kids home to first unbox my Cricut Maker, since I knew that I would need to not only figure out how it works, but also figure out how to use Design Space, where your projects and designs are created. I was pleasantly surprised at how extremely easy and user friendly the entire set up was! I probably could have figured it out with all three kids hanging on me–it was that intuitive! To set up the Cricut Maker, I just went to the Cricut website and found the set up page. From there, I clicked the green “Get Started” button at the bottom and it walked me through the entire Cricut Maker set up, as well as an introductory greeting card project to help me learn the ropes. All materials for the greeting card project are included with the Maker machine, and because the project uses multiple settings and pens, after creating the quick greeting card, I felt confident enough to dive into making and designing myself! My “new technology” worry was all for naught! I went into my Cricut Maker exploration day with full intention of diving into its capabilities for the world of quilting, but in exploring the Cricut Design Space, I accidentally–OOPs!–ended up bedazzling one of my daughter’s tank tops with a glittery iron-on unicorn! The Cricut Maker Design Space has a large library of free graphics, templates, and projects and as soon as I saw this unicorn, I knew it just had to make its way into our world. Cricut sent me a box full of supplies along with the Cricut Maker, and a roll of silver Glitter Iron-on was included. Even though the entire process was new to me, I couldn’t resist figuring out something new. Besides, glitter + unicorns = magical! Another big perk to the Cricut Maker is the huge library of available videos and tutorials available. A simple search found me a huge selection of tutorials, from the actual Learn page on Cricut, to a multitude of YouTube tutorials by craft bloggers. It didn’t take me long at all to have the unicorn cut since it was a free image already in the Design Space, and the Cricut Weeder tool was the perfect tool to help get the background away from the iron on transfer, all while making me feel like a glittery unicorn-loving dentist. The weeder tool comes in the Cricut Tools Basic Set, which is definitely worth getting if you have a Maker. Within a half an hour, I had a fully bedazzled unicorn tank, which fortunately my daughter LOVED when she got home from school. The Cricut Maker comes with a fine point pen, but there are also a wide variety of other pens available for diversified projects. The pen I will likely use most in my quilting is the washable fabric pen. This is great for drawing on cut lines, seam allowances, embroidery guidelines, and more. It’s quite easy to designate lines in Design Space as a drawn line rather than a cut line, too, so you can have the Cricut Maker both draw and cut on the same fabric. The pens and blade tools are *really* easy to install and switch, since they are held in with an easy snap clamp, and the Cricut Design Space prompts you on what pen or blade to insert before each project so that you’re sure to use the correct blade for your project. The Cricut Maker comes with a premium fine point blade, which is used for cutting paper, card stock, vinyl, leather, and other light-weight to medium-weight materials. What makes it really useful for quilters, though, is that it also comes with a rotary blade for cutting fabric. Using the sticky pink FabricGrip mat and the rotary blade tool, the Cricut Maker can cut standard quilting cotton and other fabrics without needing to stabilize them first. Watching this little rotary cutter at work is super fun, too, since its little robotic lift, turn, press, cut, repeat is like taking a trip to the future. Now that you’ve seen the rotary blade from every angle, wouldn’t you agree that that’s the cutest little rotary blade you ever did see? The blades snap into the little B compartment to the right of the A pen holder, and it’s incredible easy to switch blades when needed. The Cricut Maker also has ample space for storage of unused blades, pens, and tools, which is really handy for someone like me who doesn’t have a whole lot of extra storage space. My hands down favorite features of the Cricut Maker are its design versatility and ease of use. You are not limited by the shape of a specific die, or even by a set library of designs. Because the Cricut Design Space is so user friendly and easy to figure out, and because there are so many fabulous tutorials available to help walk you through the details, I know that the sky’s the limit with design. For a pattern designer like me, that aspect is KEY. helping my kids create cards for Thank Yous, holidays, etc. I’ve already designed a little robot for my son, who loves robots and goes around telling people that they are either in or falling out of favor in his eyes because of the number of hearts in their heart tanks. For example, when I do something he really loves, he says, “You just got 10,000 hearts in your heart tank!” and if we tell him he can’t have a second cookie, he says, “Your heart tank is almost empty!” in a warning voice, finger wagging for emphasis. How perfect is this little robot for him? I’m thinking I’ll make it a layered card stock creation to frame for his room. This was easy to make, since the robot is a free image in the Design Space, and adding the heart, customizing colors, and adding the text was very straightforward. As you can see, one little afternoon with the Cricut Maker, and my to-make list has already grown quite a bit! Can you blame me? Now for the nitty gritty: how much does the Cricut Maker cost? The Cricut Maker machine retails for about $399.99. When you buy a Cricut Maker, in the box you get: a Cricut Maker™ machine, Rotary Blade + Drive Housing, Premium Fine Point Blade + Housing, Fine Point Pen, FabricGrip™ Mat 12″ x 12″, LightGrip™ Mat 12″ x 12″, welcome book, USB cable, power adapter, Cricut Access™ free trial membership, 50 free ready-to-make projects, including 25 sewing patterns, materials for a first project. If you plan to use the Cricut Maker for primarily quilting and fabric-related projects, you might want to get the Cricut Maker + Essentials Collection ($459.99), which comes with two larger 12″x24″ FabricGrip Mats and washable fabric pen, among other sewing-related tools. As I said earlier in the post, I don’t have any affiliation with Cricut, so I don’t get anything if you buy one. I’m simply sharing what I know and my experience with the Cricut Maker to help you decide if it’s a tool that would work well in your life. I’m excited about the world of possibilities that exists with the Cricut Maker, and I’ll be sure to share my projects and experience as they happen. I’m excited about a new knife blade that will be coming out soon that will allow for cutting thicker, tougher materials like balsa wood and chipboard. The Cricut Maker’s Adaptive Tools System™ is perfect for the makers among us who don’t want to be limited to just one craft! 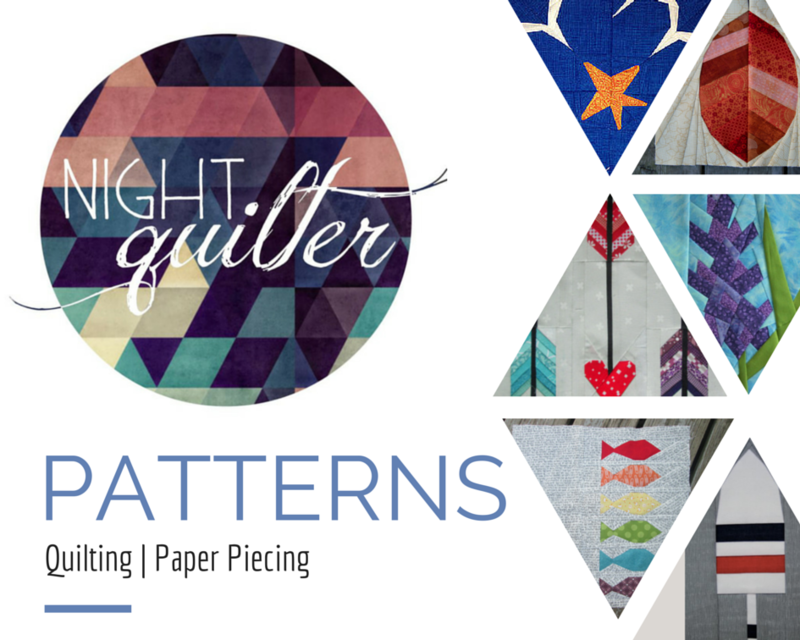 Here’s a sneak peek at a project tutorial I’ll be sharing for the Cricut Maker next week that pairs quilting and embroidery, so stay tuned! What would you make with a Cricut Maker? Wow, this has so many options, and you have given it a thorough “road test”. I am sure the family will put in orders!!! What a great review, Kitty. I have a few questions. What size is it (does it take up a lot of room)? I assume the blades are replaceable? Do you know how often, and are they pricey to replace? I’m looking forward to seeing what you are creating with that Twinklestar Berry fabric! First off, I’m so sorry for the delay in getting back to you on this! Since I’ve only been playing with my Cricut Maker for a short time, I wasn’t positive about the longevity of the blades, so I wanted to ask around. I got an answer and then got wrapped up in Easter! Anyway…. there is a replacement blade kit that is sold for just over $11, so yes the blades eventually need to be changed. However, from what I have been told, the blades last a lot longer than on a manual rotary cutter since all of the pressure and movement is done by machine. Julie from Intrepid Thread has been using hers to cut EVERYTHING for a good number of months and still has not needed to replace the blade. As for the size, the machine dimensions while not in use are approximately 23″ wide, 8″ deep, and 6″ tall. It doesn’t take up much space at all. Note that when you use it, you need at least 10″ clearance in front and behind the machine when you use the smaller mat, and more when you use the larger 24″ fabric mat. I just store mine on top of a cabinet when not in use and then put it on a table when I use it. Hope that helps, and thank you for your patience!! Oh I’ve been eyeing those but just wonder how much I’d actually use it; you’re pretty convincing though that this is a fun and versatile machine. Hmmm… Thanks for the great review! Thanks for the review. I’ve been thinking about getting one of these machines and it’s nice to know all the details. I have the cricut explorer air 2 and there’s so much you can do and now there’s the cricut maker!! I need to check this out.